New 100 seater Terrace Restaurant for families. Breakaway 60 seater fully airconditioned adults-only restaurant and private events venue. 1 new family bure makes 4! Following severe Tropical Cyclone Evan in December 2012, the resort has undergone many improvements including the replacement of new staff accommodation, a new maintenance workshop and laundry. For the resort’s valued guests and in keeping with its colonial theme, a new restaurant complex has been created comprising the 100 seater Terrace Restaurant for families and Treetops, a 60 seater adults only restaurant - both overlooking the resort’s pools and lush gardens. The restaurants will be serviced by a new F$1M state-of-the-art, fully equipped kitchen and bar. Treetops Restaurant will also be air-conditioned and provide a stunning breakaway dining experience for groups and weddings and, make a perfect venue for small meetings and conferences. Malolo has a sound reputation for excellence in food variety, quality and value for money, offering a multi-national flavoured menu with local Fijian touches spread across all the dining venues. Benefitting from Malolo’s new kitchens, the island is proud to introduce its new Executive Chef team, Executive Chef Yngve Muldal and Head Pastry Chef Rhéa Pacaud. Yngve and Rhea bring extensive experience from restaurants and venues around the world. They will be using this experience and expertise to produce quality Asian and Pacific Rim cuisine using only the finest products, and combining local ingredients and themes to tantalise the most demanding taste buds. With the increase in the size of the restaurants, the resort will provide additional improved facilities including a new teenager lounge, and adults only retreat. The area around the adults pool - with swim up bar, has also been extended to include daybeds and new loungers. These areas now complement the already popular Tia’s Kids Club and reinforces Malolo as a true destination for all ages. Also in the mix of improvements, Malolo has added a new covered arrivals and departures bure and a new activity beach hut also incorporating the dive shop. A final very important addition is the introduction of a 4th Family Bure. The addition of this new Bure will now give Malolo 4 of these very popular rooms and will increase the overall resort inventory from 45 to 46 bures. This new Family Bure is part of a newly constructed, two-storey beachside building which will house two family bures – one at ground level and one above it. These rooms can sleep up to 7 people and comprise of two bedrooms, two bathrooms with a spacious living area and open verandah. Malolo reopens on 19th August 2013. 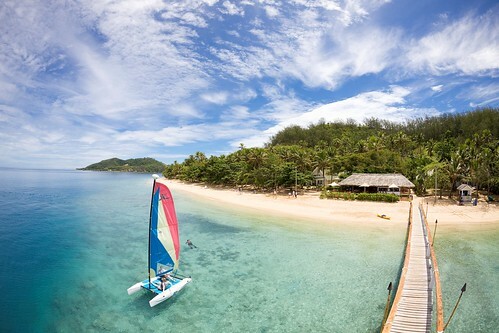 Malolo resort is located in Fiji’s Mamanuca archipelago just 25km/16m west of Nadi International Airport. This 100% Fijian family-owned resort has been a long-time favourite for families and couples alike, and over the years has welcomed back thousands of return visitors. Prices from only AUD$220*pp per night twin share. Kids Eat Free and Resort Credit packages available. For further information on the new look Malolo visit www.maloloisland.com. Bookings and enquiries can be made directly with Malolo on enquiries@ahurareosrts.com, www.maloloisland.com, or through a Fiji travel specialist.